(CNN) -- When Carol Weiher was having her right eye surgically removed in 1998, she woke up hearing disco music. The next thing she heard was "Cut deeper, pull harder." She desperately wanted to scream or even move a finger to signal to doctors that she was awake, but the muscle relaxant she'd received prevented her from controlling her movements. "I was doing a combination of praying and pleading and cursing and screaming, and trying anything I could do but I knew that there was nothing that was working," said Weiher, of Reston, Virginia. Weiher is one of few people who have experienced anesthesia awareness. Although normally a patient does not remember anything about surgery that involves general anesthesia, about one or two people in every 1,000 may wake up during general anesthesia, according to the Mayo Clinic. Most of these cases involve the person being aware of the surrounding environment, but some experience severe pain and go on to have psychological problems. The surgical tools didn't cause Weiher pain -- only pressure -- but the injections of a paralytic drug during the operation "felt like ignited fuel," she said. "I thought, well, maybe I've been wrong about my life, and I'm in hell," she said. The entire surgery lasted five-and-a-half hours. Sometime during it she either passed out or fell unconscious under the anesthetic. When she awoke, she began to scream. "All I could say to anyone was, 'I was awake! I was awake!' " she said. The use of general anesthesia is normally safe and produces a state of sedation that doesn't break in the middle of a procedure, doctors say. The patient and anesthesiologist collect as much medical history as possible beforehand, including alcohol and drug habits, to help determine the most appropriate anesthetic. You may think of it as "going to sleep," but in terms of what your body is doing, general anesthesia has very little in common with taking a nap. During sleep, the brain is in its most active state; anesthesia, on the other hand, depresses central nervous system activity. On the operating table, your brain is less active and consumes less oxygen -- a state of unconsciousness nothing like normal sleep. Doctors do not know exactly how general anesthesia produces this effect. It is clear that anesthetic drugs interfere with the transmission of chemicals in the brain across the membranes, or walls, of cells. But the mechanism is the subject of ongoing research, Dr. Alexander Hannenberg, anesthesiologist in Newton, Massachusetts, and president of the American Society of Anesthesiologists. Patients who remember falling unconscious under the anesthesia generally have a pleasant experience of it, Hannenberg said, and the period of "waking up" is also a relaxed state, Hannenberg said. Anesthesia awareness may relate to human error or equipment failure in delivering the anesthetic, Hannenberg said. There are patients for whom doctors err on the side of a lower dose because of the nature of their condition, Hannenberg said. Someone who is severely injured and has lost a lot of blood, a patient with compromised cardiac function, or a woman who needs an emergency Caesarean section would all be at risk for serious side effects of high doses of anesthetic. Heart or lung problems, daily alcohol consumption, and long-term use of opiates and other drugs may put patients at higher risk for anesthesia awareness, according to the Mayo Clinic. 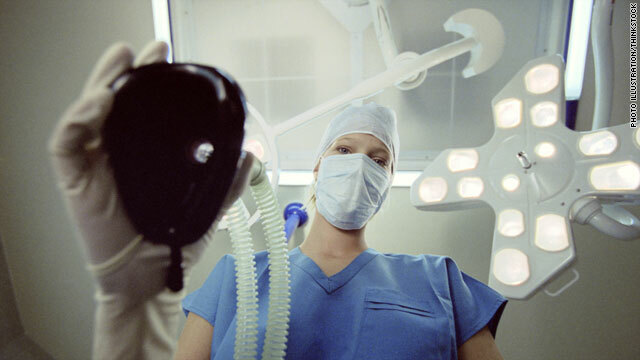 Weiher started a campaign called the Anesthesia Awareness Campaign that seeks to educate people about the perils of waking up during surgery. She has spoken with about 4,000 people worldwide who have also had anesthesia awareness experiences. The American Society of Anesthesiologists is engaged in an Anesthesia Awareness Registry, a research project through the University of Washington to examine cases of the phenomenon. One of the goals of the Anesthesia Awareness Campaign is to make brain activity monitoring a standard of care. There has been controversy about the use of brain function monitors in general anesthesia. Advocates such as Dr. Barry Friedberg, anesthesiologist and founder of the nonprofit Goldilocks Anesthesia Foundation, say brain monitoring is essential for ensuring the patient achieves the appropriate sedation so as to not wake up. The monitors use a scale of 0 to 100 to reflect what's going on in the brain: 0 is a total absence of brain activity, 98 to 100 is wide awake, and 45 to 60 is about where general anesthesia puts the patient, Friedberg said. But a 2008 study in the New England Journal of Medicine found no benefit in using brain function monitoring to prevent anesthesia awareness. The American Society of Anesthesiology has said the monitoring is not routinely indicated for general anesthesia, but may have some value and be appropriate for specific patients. The downsides are that they are expensive, and should not be used in place of heart rate and breathing signals when regulating the anesthesia. Research does not consistently demonstrate a benefit from using brain function monitors, and the decision to use them should be made on an individual basis, Hannenberg said. The anesthesiologist carefully monitors the patient's breathing and blood pressure, which can rise and fall, while the person is under the anesthetic, Hannenberg said. The treatment is tailored to the patient -- a young, healthy athlete will tolerate fluctuations in blood pressure better than someone with a serious condition, Hannenberg said. As with surgical procedures themselves, anesthesia can result in stroke, heart attack and death. Such complications are more likely in people who have serious medical problems, and elderly people. Over the last two decades, anesthesiologists have made significant strides in reducing those risks, Hannenberg said. A 6-year-old boy in Richmond, Virginia, recently died after going into cardiac arrest during a routine dental procedure that involved general anesthesia, CNN affiliate WTVR reported. Weiher had to have subsequent surgeries, including an operation on her other eye and a hysterectomy, and the experiences were terrifying. She is still taking medication for post-traumatic stress disorder as a result of her anesthesia awareness experience.